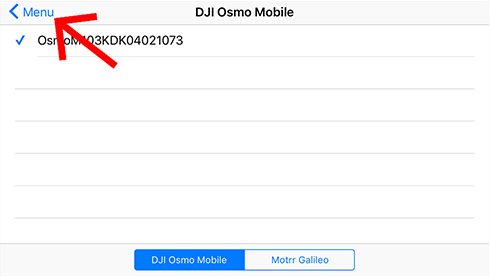 If you haven’t set up your DJI Osmo Mobile or DJI Osmo Mobile 2 before, refer to DJI to learn how to pair the gimbal to your phone. 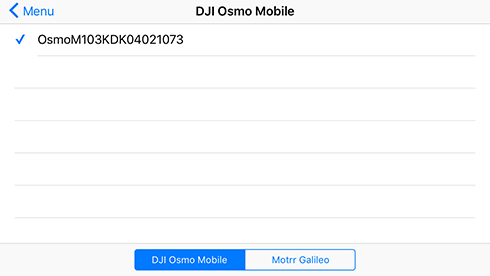 After setting it up the first time you are ready to connect the DJI Osmo Mobile to Switcher Studio. Bluetooth is enabled on your phone. 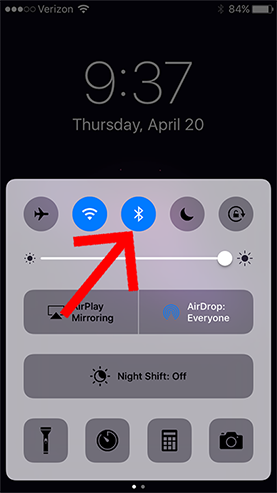 To check this on your phone, slide up from the bottom of the screen to reveal the Control Center and make sure the Bluetooth logo is highlighted blue. If it is not, tap the icon. Make sure that the DJI Osmo Mobile app is closed. To check this, unlock your phone and double-tap on the Home button, scroll to the left, find the app, and slide up to completely close out the app. Now that we are ready, start by docking your iPhone into the DJI Osmo Mobile, and tighten down the back screw. Once your iPhone is secure, turn on the Osmo Mobile, and the gimbal should straighten out...showing that it is ready. Next, launch Switcher Studio on the iPhone set in the Osmo Mobile. In the upper-right corner, you will see an icon of three lines. Tap on that icon. 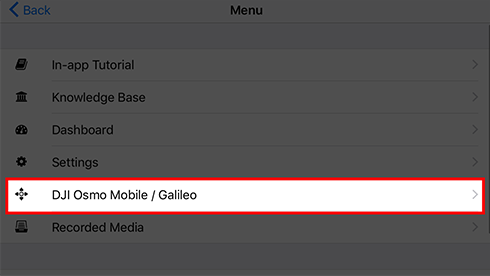 On the list that appears, tap on “DJI Osmo Mobile/ Galileo". Wait a few seconds, and your DJI Osmo Mobile will show up in the list. Tap on the Osmo Mobile that you wish to connect. 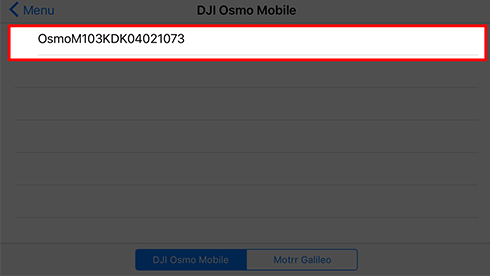 A blue checkmark will appear to the left of the Osmo Mobile that you selected, showing that is has been connected. 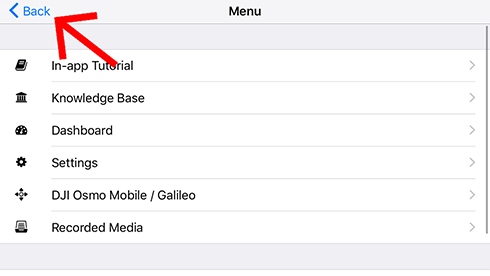 Tap the “Menu” button in the upper-left corner, and then tap “Back” in the upper-left corner on the next menu. You are now ready to use your DJI Osmo Mobile with Switcher Studio. Connect the camera to your main switching device as you normally would. Now, when you move that source to the “Preview” window inside of Switcher Studio, you can remotely Pan and Tilt using the DJI Osmo Mobile. If you have followed the above steps and are still having issues connecting: Go into your grey "Settings" app. Choose "Bluetooth" settings and "forget all devices". 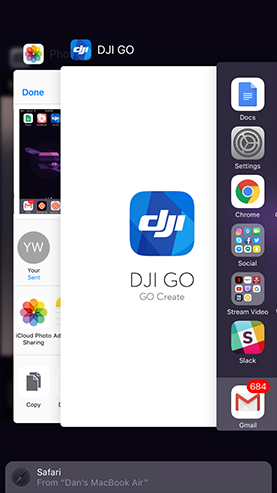 Make sure that you re-register your device by using the DJI app first. 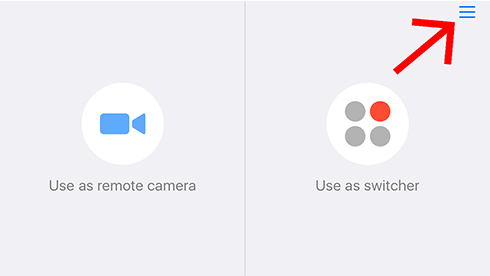 After setup, make sure to ignore Apple’s pop-up to connect the device and only pair via the Switcher menu (Sometimes Apple tries to pair the Osmo as a keyboard).